Regardless of the wood type, refinishing a wood deck is not as difficult as it is time consuming. With the proper tips and tools, however, a major deck refinishing project can be rather simple and will go much faster. 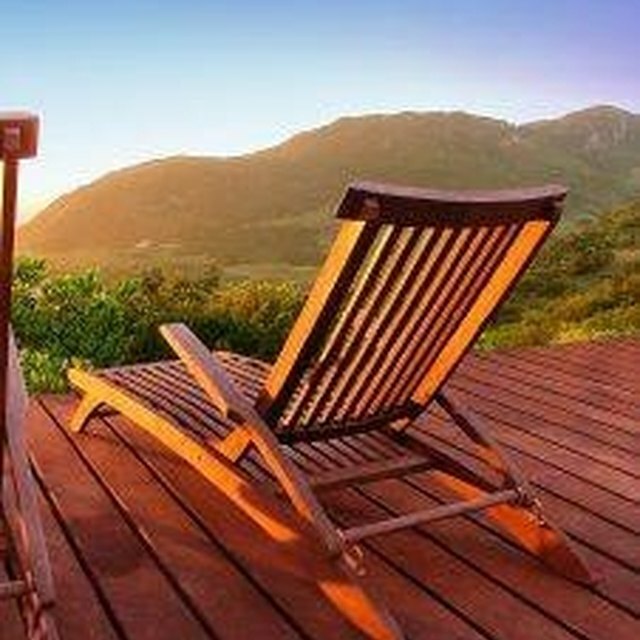 There are many tools to use when refinishing a teak deck, and this article will mention most of them, but if you have a large deck to refinish, do yourself a favor and use the power tools whenever possible. Remove all grills, furniture and other items from the deck. Using the brush and bucket or the pressure washer, clean the deck with water and the deck cleaner. Do not to let the spray from the pressure washer linger in any areas, or the force of the water may damage the wood. Using a pressure washer of less than 1,000 PSI can reduce the risk of damage to the wood. Be sure to wash up under the railing and between all stair parts and railing uprights. Allow the deck to dry thoroughly. In some climates, this might take a few days. Use the hammer to pound down any protruding nails that have worked themselves loose over time. Use the roller and paintbrush or the paint sprayer to apply an even coat of deck stain. Use the brush for tight spots on railings and the like. Allow the stain to dry for a day or so and re-coat if recommended by the stain manufacturer. Allow the stain to dry for several days before allowing foot traffic or returning deck furniture to the deck. Shelley Kishpaugh has written numerous articles for Demand Studios and Helium on a wide variety of topics, and she is currently writing a children's book. Kishpaugh received a B.S. in psychology from the University of Colorado and has been writing professionally since 2007.